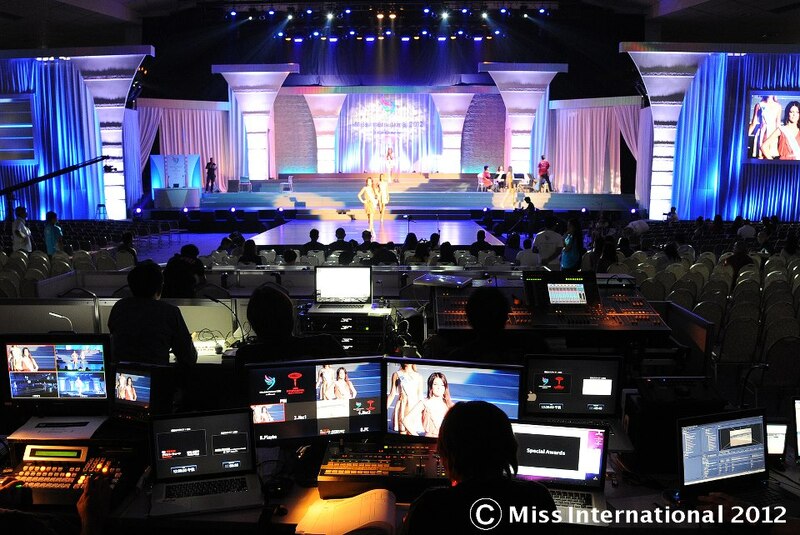 Time to look back at the stages used for the Miss World, Miss Universe, Miss International, and Miss Earth Pageants last year. It is hard for me to put into words to express how much I loved this stage. I was so extremely excited when I saw this stage for the first time and could not wait to see what would happen on it. 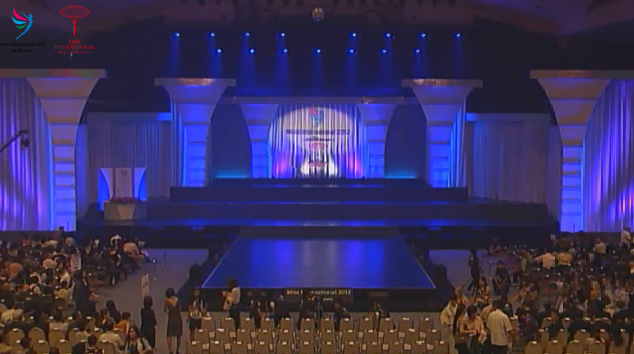 When I saw this stage for the first time, it reminded me of some of my favorite stage for Miss World Pageants of years gone by - 1992, 1993, 1996, and 1998. The thing about this stage that I probably appreciate the most is that it not only pays homage to the host city but it was also very sleek and modern at the same time. This is really not easy to achieve actually. 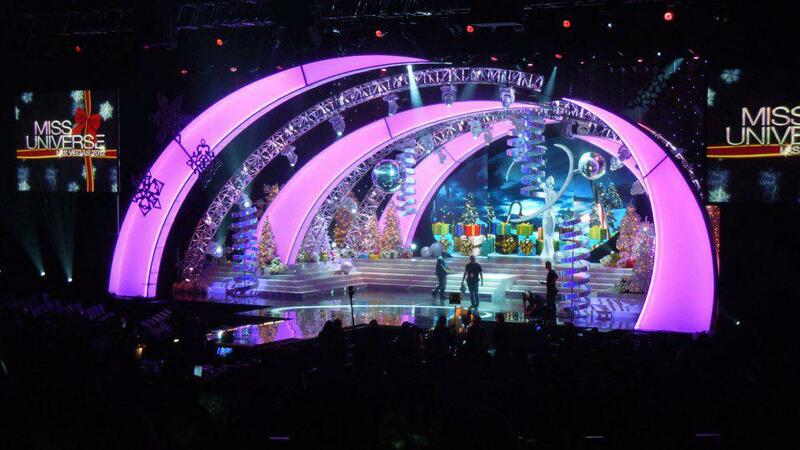 In the old days, it was all about displaying as much of the cultural elements of the host nation as possible but in recent years in the bid to modernize pageants, we've seen much sleeker and more subtle stages. So I really think it was perfectly designed and brought to life. It was a perfect combination of cultural elements, glamor, modern trends, and old school splendor. Looking forward to something equally spectacular in Indonesia this year. 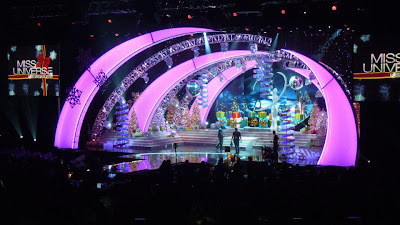 Miss Universe stages are always nicely done and 2012 was no exception. The only thing, for me, the exposion of Christmas and snowflakes was just a bit too much. Overkill. I would have gone with "less is more". There was just too much Christmas going on. 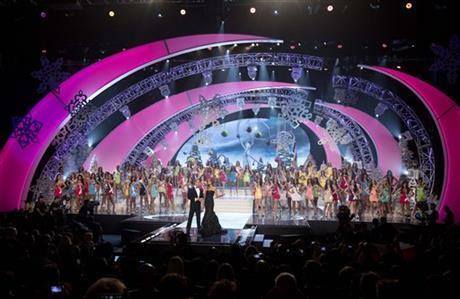 The Miss International stage was actually better than expected. 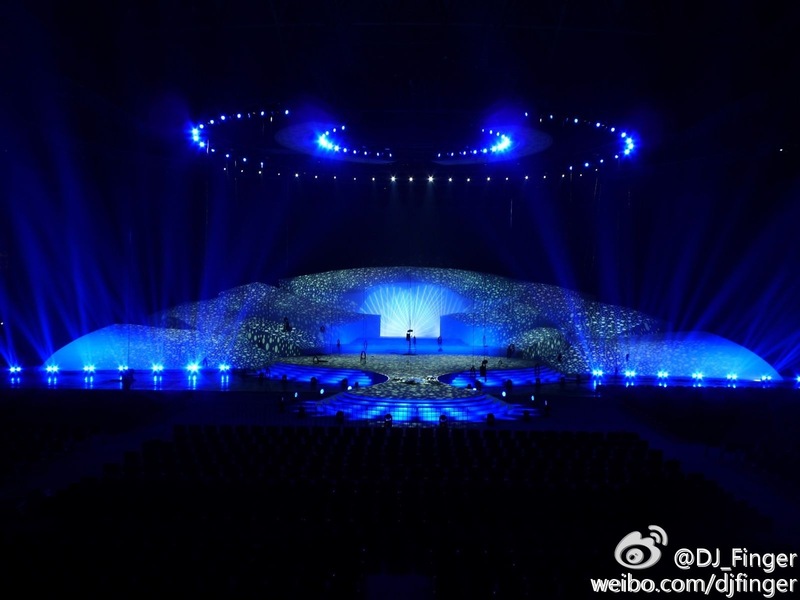 I pretty much expected a rather bare stage with no design at all so it was surprising to see something like this. BUT... for a pageant that's supposed to be the third oldest and most prestigious pageant it was not really good enough at all. In fact, I've seen national pageants with a more impressive stage design. I am probably scoring this one higher than I should because in all honesty... there was not much of a stage. The mansion's balcony with its tons of stairs and swimming pool formed the stage. I think the only obvious addition was a cool ramp over the swimming pool which did appear to be quite slippery. So why did I score it higher than I think I should've?! Probably because it was something I have not seen in a while and I thought the ramp over the swimming pool was kind of cool... although from the wrong angles it all appear quite amateurish. * The Pageant Report Card is solely based on the opinion of the owner/editor of Eye For Beauty Blog, Andre Sleigh. It's just a fun way to look back at 2012 and put Miss Universe, Miss World, Miss International, and Miss Earth in unofficial competition with each other.